You can’t talk about Aaron Franklin and his revered Austin institution, Franklin Barbecue, without talking about anticipation. If you want to sample some of Franklin’s namesake brisket and ribs—regarded as among the best in Texas—you almost certainly can’t do it without waiting for a long, long time. That’s one of the not-so-secret ingredients: anticipation. The relief of tension once you reach the front of the line—it could be seven, eight hours—makes the barbecue taste that much better. Franklin Barbecue wouldn’t be held in such high esteem, and draw such long wait times, if Aaron Franklin’s mastery of barbecue wasn’t so deep and all-encompassing. His 2015 debut book Franklin Barbecue: A Meat-Smoking Manifesto is less cookbook and more philosophy tome, one that attempts to impart readers with a sixth sense. 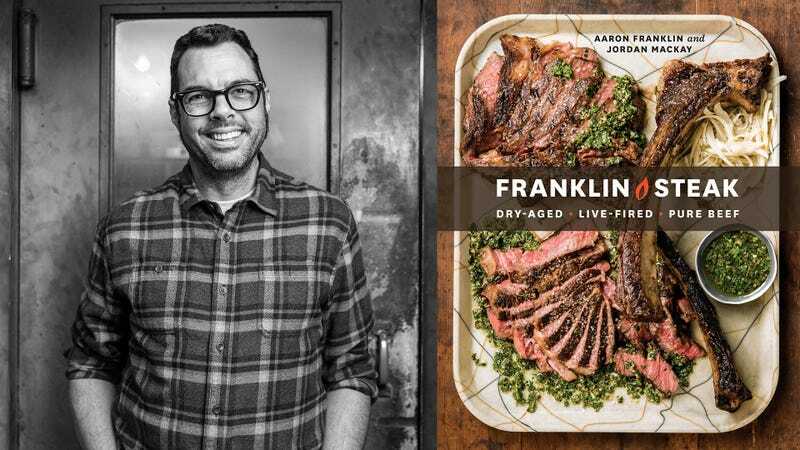 Likewise, his newest book Franklin Steak makes the case that you can cook better steaks if you can learn to intuit. The presents a staggering amount of steak knowledge, more than you thought was ever possible. There is nary a recipe in its first 175 pages. Instead, the book presents the deepest of dives on cuts of the steak, marbling, color, fiber, dry-aging, methods of cooking, fuel, thickness, anything and everything. Retire the trophy, there is nothing more to say about steaks after this release. We spoke with Aaron Franklin from his restaurant in Austin about grilling steaks. The Takeout: I can’t imagine the number of steaks you cooked while researching this book. Is there anything you learned about your relationship with steak? Aaron Franklin: Everyone thinks, “oh, ribeye is king.” Turns out, there are definitely other steaks I think are better for my personal taste. After I cooked about 100 New York strips for this book, I realized it’s my favorite steak. Texturally I like it better. When you get ribeye that’s really fatty, it’s a bit off-putting for me. Just because it’s fatty, it doesn’t mean it’s good, and not all fat is created equal. I like the texture of a strip but also the flavor. It’s a lot more beefy. And I think it takes the grill flavors a bit better. TO: In the book you encourage readers to seek out butchers and farms that raise beef responsibly. But that’s not always possible. If we’re picking up commodity beef from the supermarket, how can we elevate that steak experience? AF: If we did it right, hopefully you can go through the book and develop a sense. You might look at a steak at the supermarket, maybe it has a name that’s not as familiar. You inspect its marbling, the color, and go, “oh yeah, I know how to cook that. You learn different cooking methods for different cuts. Maybe it’s a leaner, thinner piece, so you leave it in the fridge, then cook in a hot skillet with butter. Maybe you realize it takes better to a grill. That’s what we’re trying to get across this book: It’s choose your own adventure. TO: What’s one piece of equipment the home cook can invest in for really superior steaks? TO: What do you think about a digital thermometer? I wouldn’t want an overcooked steak. AF: Actually, I kind of don’t think so. If you cook different steaks at, say, 128.5 degrees Fahrenheit, they’re going to be cooked completely different. The goal in any cooking, especially steak, is that you have to anticipate the carryover, how fast it’s cooking, how much momentum it has, thinking about the inertia of a piece of meat. Just because you pull it at a certain temperature, it doesn’t mean it’s going to finish at that temperature. Also there’s different fibers: Grass-fed versus corn-fed versus grain, those temperatures are going to mean different things for each piece of meat. So I don’t feel a thermometer is a good purchase. If you’re cooking a piece of meat and you want it a certain way, maybe you pull it a bit early, let it rest for a couple of minutes, then cut a little slice in the middle and take a peek. You can always throw it back on if you need to cook it a bit more. TO: I enjoyed this book for the same reason I enjoyed the barbecue book, in that it’s as much developing intuition as finessing a method. AF: It takes practice for sure. I’ve got a long way to go, and I’ve cooked a tremendous amount of meat. It’s having the mentality of always learning. Thinking about subtleties is what make people better cook. Always ask “why?” The more you think of it, the more you develop that sixth sense. TO: I was surprised and delighted to find a recipe in here for raw tomatoes. AF: Similar to the barbecue book, we didn’t want any recipes. If you read it, hopefully you have a game plan without recipes. In the steak book, the raw tomatoes recipe articulates that. At the end of the day, what do you want to eat? One of my favorites is fresh tomatoes out of the garden, sprinkled with salt, a little vinegar and oil. I think that’s perfect with a steak. It’s got brightness, acidity to cut through the fattier steak, it’s got umami. That’s what we like to eat, and that’s what this book is about. And we went with it. TO: Obviously a good piece of steak doesn’t require sauce. But if you had to take a steak sauce with you to a desert island, which one could you live with the rest of your life? TO: Everywhere nowadays, I’m seeing people cook steak using the reverse sear technique. Do you have any opinions about that method? AF: Texturally, sous vide is pretty cool. My problem with it is the flavor doesn’t get in there. You don’t get the grill flavor out of it, there’s no smoke that penetrates. However, what we tend to do for parties is the reverse sear. If you have a party with a lot of people, that’s a way of cooking a bunch of steaks and picking it up on the grill. Reverse sear is great for larger pieces of meat, but I’m not a fan of the sous vide method. It lacks the flavor. And to me, it’s more convenient to build a fire. Fire’s been around for a really long time. TO: Plenty of people love filet mignon, but I find it lacking any flavor. How do I make it palatable? AF: Everyone thinks filet is terrible, but I love a filet. It doesn’t have a lot of fat, and not a tremendous amount of flavor, but texturally it’s feathery, the way those fibers break down. You can cook it almost super rare, and it’s a really beautiful piece of meat. What we came up with is to use a hot skillet, salt the filet, dry it to get a good Maillard, cook it in a cast iron or carbon steel skillet. Use lots of butter and maybe some thyme. Spoon hot butter over the filet while you’re cooking it in the skillet. I think it’s the best way to cook a filet. Lots of butter. Steak has made the career of many a sauce. A.1., chimichurri, béarnaise, au poivre— where would any of these be without having been given a star turn next to steak? But the greatest of them all is salsa verde. Back in the day, its friends and family just called it “green sauce,” but then it got famous and went upscale, changing its name to something a little more elegant, much as Archibald Leach became Cary Grant. Three qualities make salsa verde the champion sauce. one, it is versatile. Yes, its intense flavor, tanginess, and umami richness mean it can go toe-to-toe with steak, and we’re convinced it’s better with a smoky grilled steak than with one cooked in a pan. But it is equally awesome with fish, grilled birds, even pasta. Two, it’s improvisational. We’ll give you a recipe here, but consider it just a starting point. Salsa verde can be adapted to fit your taste, so long as you don’t leave out the two foundational ingredients (and the source of its umami and punch): anchovy and garlic. Three, it lasts and can evolve. Aaron keeps a running jar of it in his fridge, refreshing it every time he has some extra of a new green. Whatever you’ve got—mint, rosemary, radish tops—can be thrown into the mix. Salsa verde will just evolve over time and will always be there for you when you need it. Pick the leaves from the parsley stems and discard the stems. You should have about two cups. Using a chef’s knife and a cutting board, finely mince the parsley, then transfer to a bowl. Using the flat side of the chef’s knife, smash the garlic on the cutting board and sprinkle with the salt. Chop and flatten the garlic and salt together until a paste forms. Next, chop the anchovies into the paste, then smear and scrape the mixture back and forth on the cutting board until the ingredients are evenly distributed and you have a fine paste. Scoop the paste into the bowl with the parsley. Finely chop the capers and transfer them to the bowl. Add the oil, honey, and vinegar to the bowl and stir to mix well. Finally, using a fine-rasp grater, grate the zest from the lemon directly into the bowl, then stir to mix. Make the sauce several hours, but preferably a full day, ahead of serving to allow the flavors to blend. To store, transfer to a jar, cap tightly, and refrigerate for up to two months. Bring the sauce to room temperature before serving. Recipe reprinted with permission from Franklin Steak: Dry-Aged. Live-Fired. Pure Beef by Aaron Franklin and Jordan Mackay, Ten Speed Press, 2019.